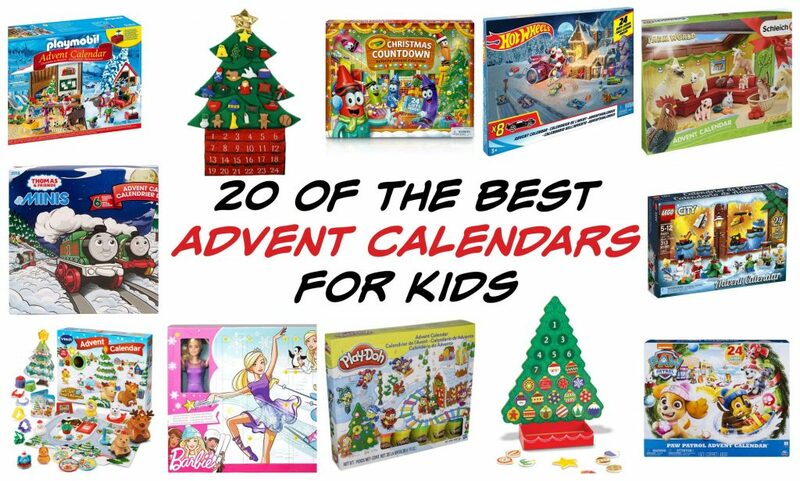 Which Advent Calendar would your child love to open this holiday season? 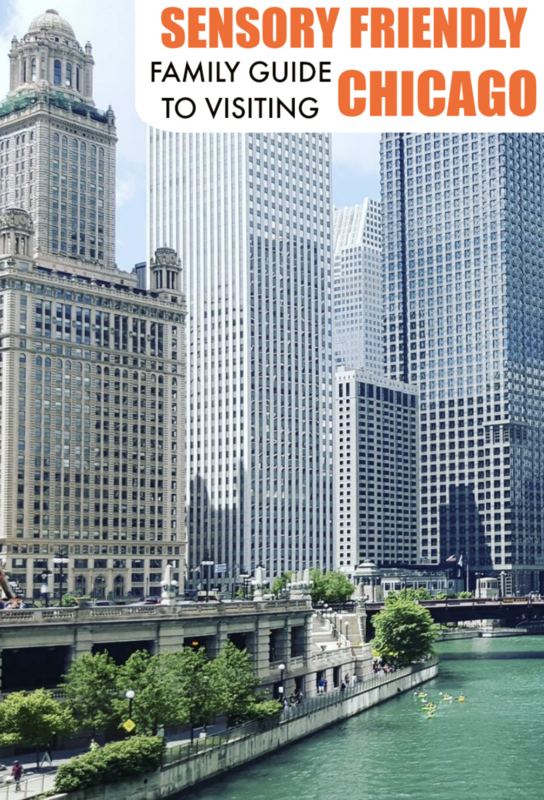 Chat with me on Twitter, Instagram, or Facebook. 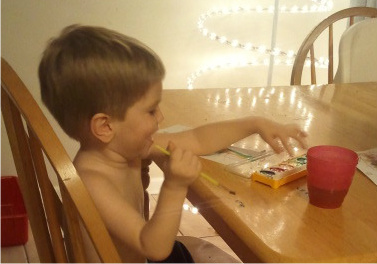 When my boys were toddler and preschool age we also enjoyed doing the Truth In The Tinsel Advent series. If you are interested in spending December impressing God’s Word on your kids’ heart this is something you’ll want to check out! You get 24 days of Scripture reading, ornament crafts, talking points and extension activities plus fun printables and templates! Learn more and get the ebook here. 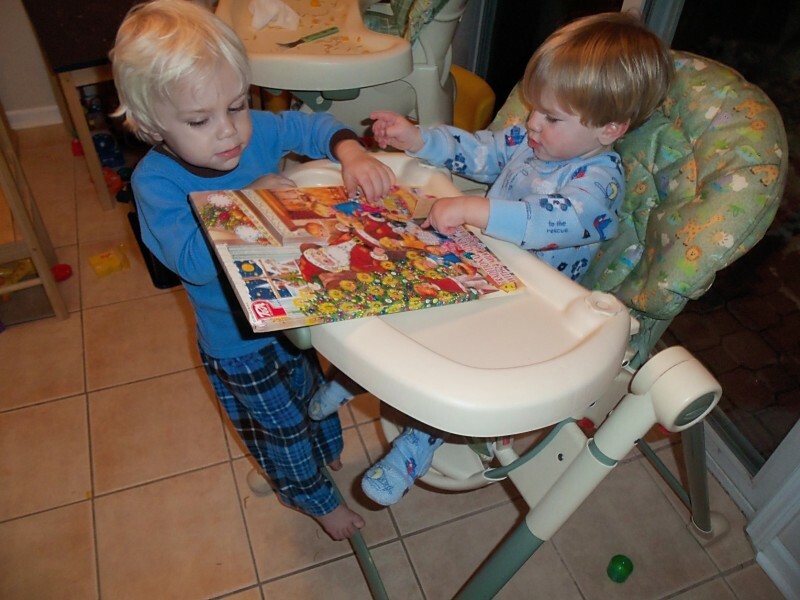 Spend December impressing God’s Word on your kids’ heart! 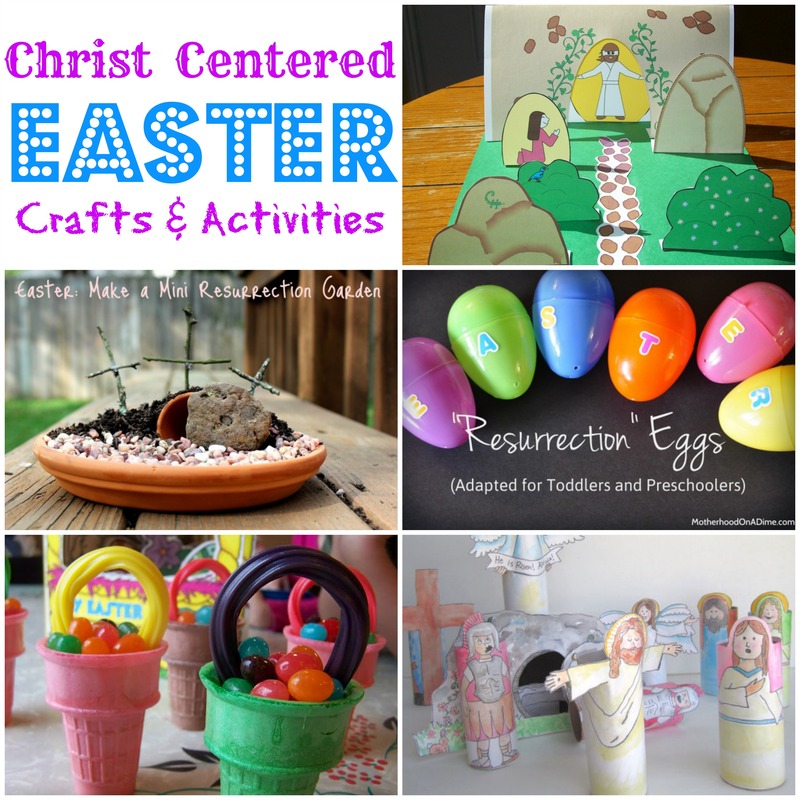 You’ll get 24 days of Scripture reading, ornament crafts, talking points and extension activities. 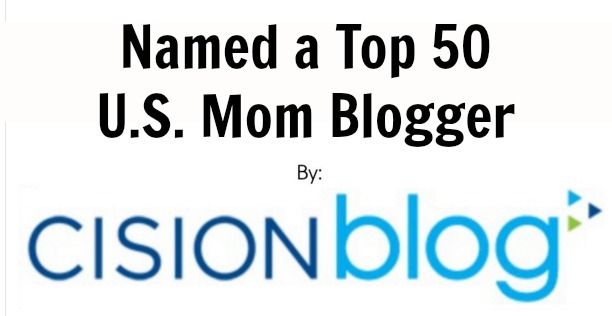 Plus fun printables and templates! This is the perfect book for kids of any age–from preschool to elementary! I loved this ebook and enjoyed spending time making Advent crafts with my children a couple years ago. I’m excited to go through this ebook again with them this year. 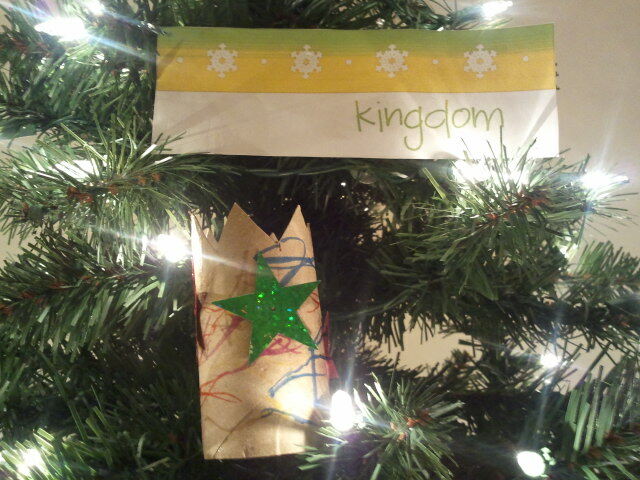 Spend December impressing God’s Word on your kids’ heart! 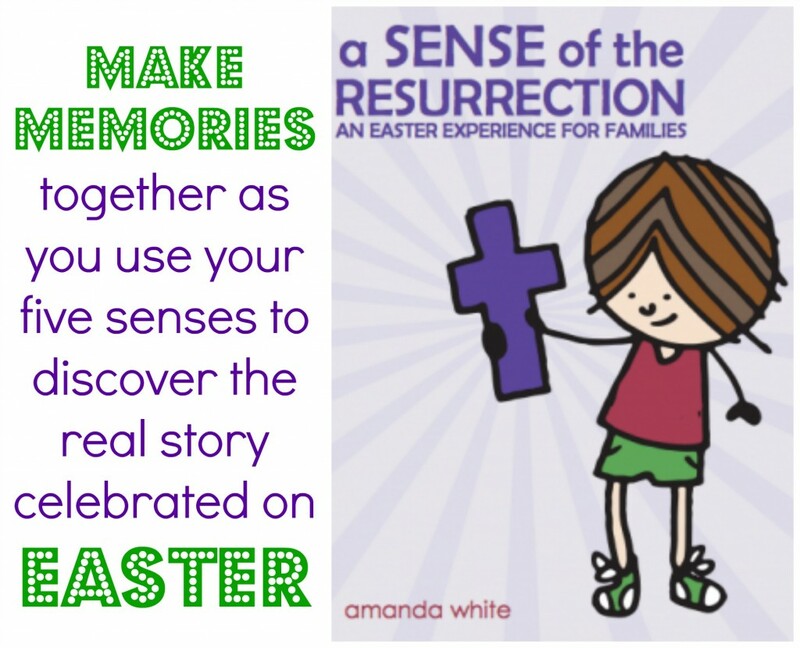 You’ll get 24 days of Scripture reading, ornament crafts, talking points and extension activities. Plus fun printables and templates! You can read my review of last year’s Truth In The Tinsel ebook here. 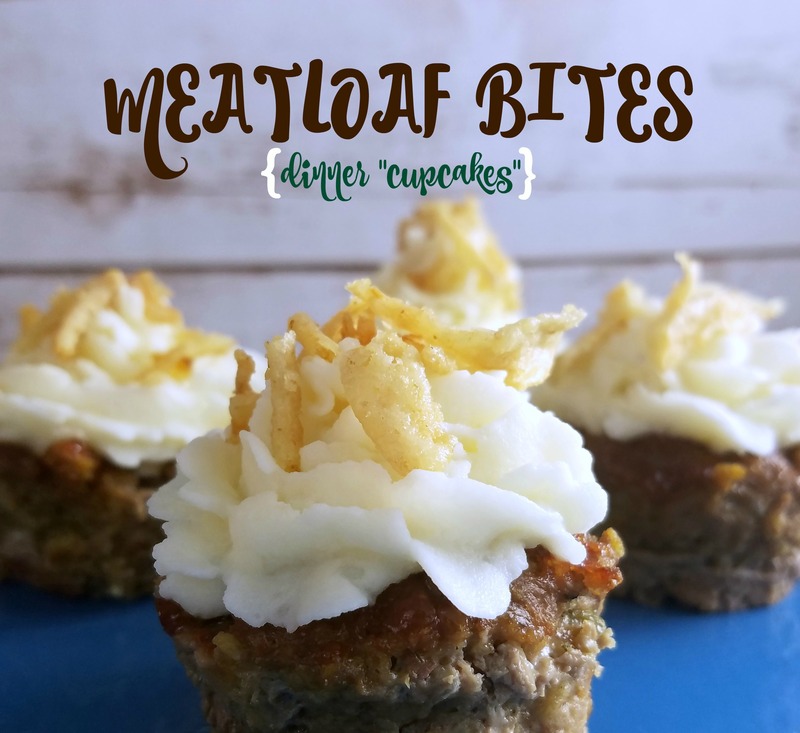 Click here to order the ebook! NEW for 2012! Get the printable Truth in the Tinsel ornaments! Use these on days you’re too busy to do a big craft, for toddlers, while you’re at Grandma’s or if you just want to save a little money on supplies! Click here to order the ornaments! 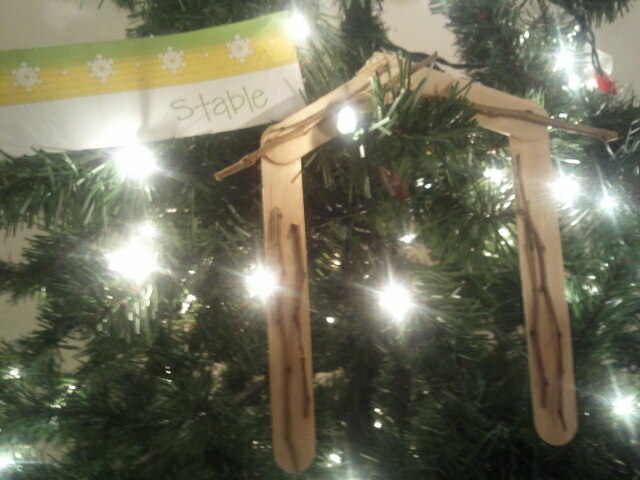 Today’s Truth In The Tinsel ornament was making a stable. 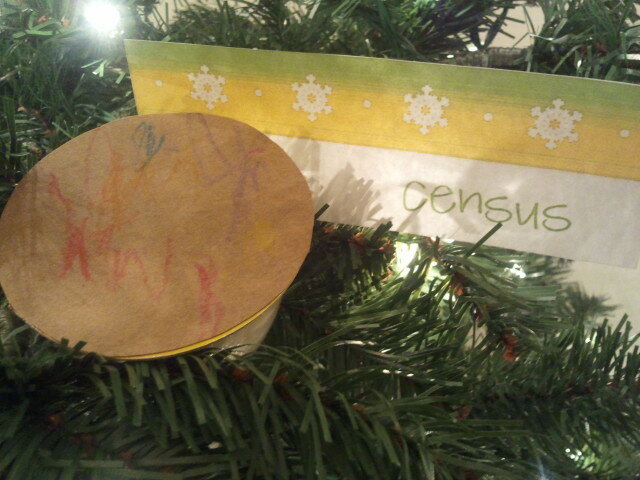 I liked this craft because it was quick and easy. We talked about how the stable probably smelled like stinky animals and Jacob thought that was hilarious. 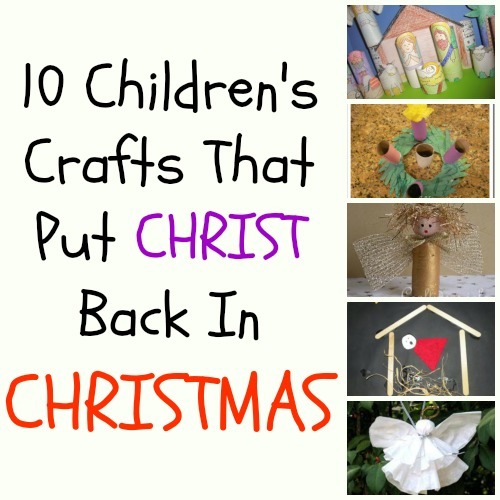 (Also, in case you missed my CHRISTmas post- there are a lot of ideas for Nativity crafts in there). If you want to make this ornament I would use the baby food jar if you have it because the one I made I can’t really put on a string to hang it. I think this would be a great craft to make at any time of the year though. It would be fun to make an “I Spy” Jar for every theme that we did and hide things that go with the theme. 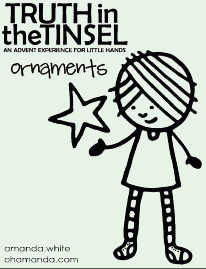 If you have been following my blog you know that we have been doing an Advent ornament a day using the Truth In The Tinsel: An Advent Experience For Little Hands book as a guide. If you were bummed that you missed your chance to join in I have good news… it’s not too late!!! Amanda is offering 20% off Truth In The Tinsel TODAY ONLY! You will also get a modified Advent plan so that you can go through the whole thing in 12 days. This book is amazing and it’s been really helpful in providing an outline of what to talk about and do to teach my three year old about the Christmas story. I really recommend getting this book if you haven’t already. You can read my review here or purchase it on sale here. Use code 12DAYS to get 20% off (which is $1) the ebook. The sale ends midnight ET. 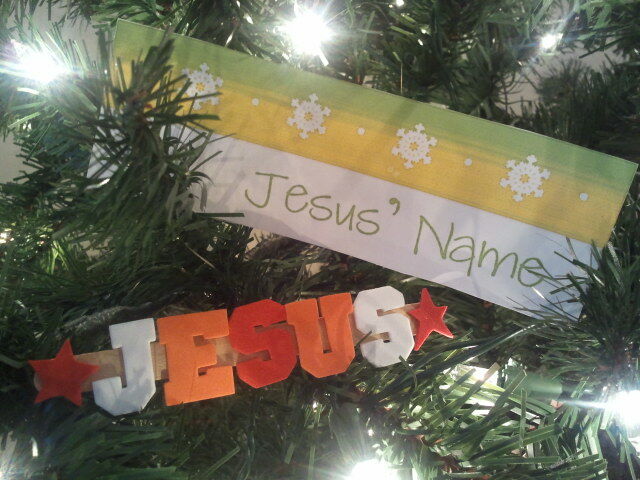 Today’s ornament from Truth In The Tinsel was about Jesus’ name. I liked Amanda’s craft for this but wanted to make it simpler for my three year old so we just used foam stickers for the letters. We talked about why that name was chosen and the letters in Jesus’ name and how His name starts with the same letter that Jacob’s does. Every day I am amazed at how much Jacob is learning. When I got the glitter paint out he noticed one color we had the other day was missing. 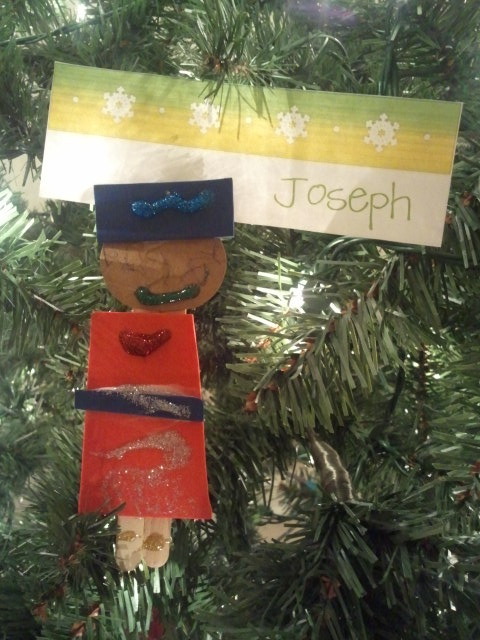 He then made sure to use a crayon to put all the facial features on Joseph (including ears) and even made a little mouth with the glitter glue. Now we have a set- Mary and Joseph. 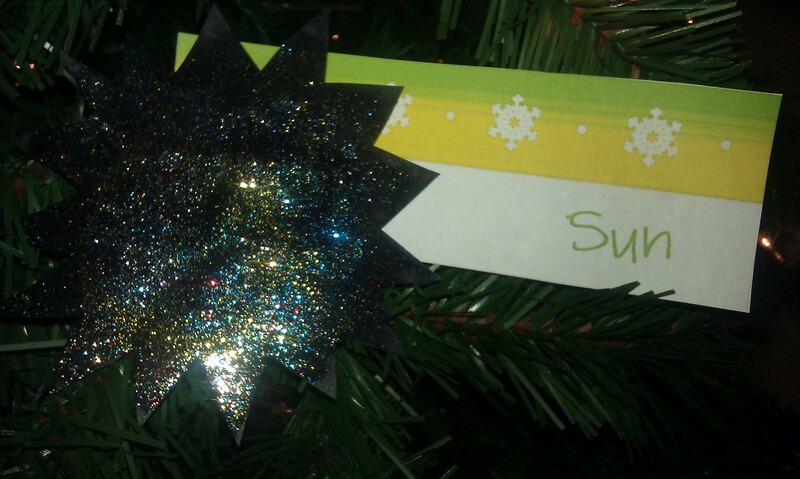 Today’s Truth In The Tinsel ornament was to make the sun. We substituted glitter paint for glitter foam and Jacob smeared the paint all over the ornament (which is a great sensory activity for him). He handled it okay but as soon as he was done he wanted his hand cleaned off. If you are participating in Truth In The Tinsel, how is it going? Are your children liking the activities? There was no post yesterday for day #6 because the boys enjoyed painting Mary and Elizabeth so much that they painted right through the paper and it was all ripped up. Today we talked about Mary’s song. 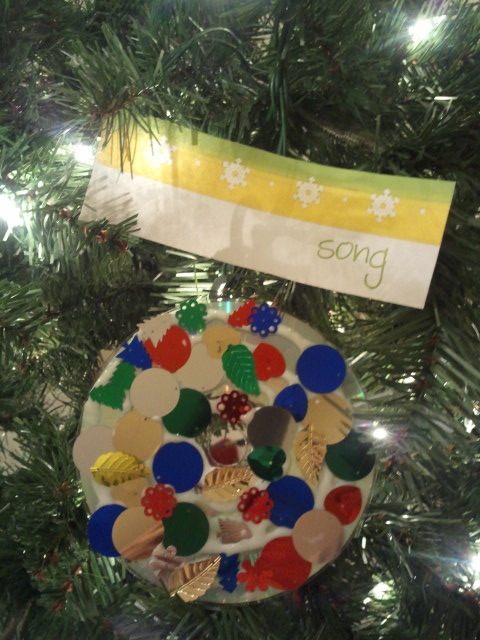 Jacob enjoyed gluing on these sequins to a CD and it was an easy craft for me to set up for him. I think it turned out great! 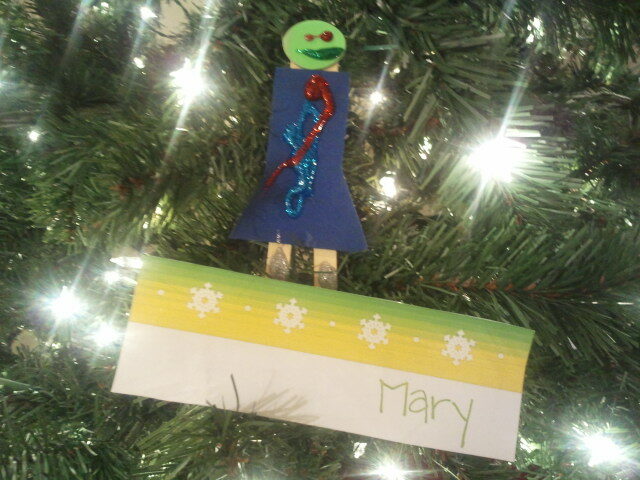 Our ornament from the Truth In The Tinsel ebook today was Mary. Jacob liked using the Elmer’s 3D Paint Pens to decorate her dress. After looking at the finished product we should have probably added hair so it looked like a girl but I think it still looks cute. 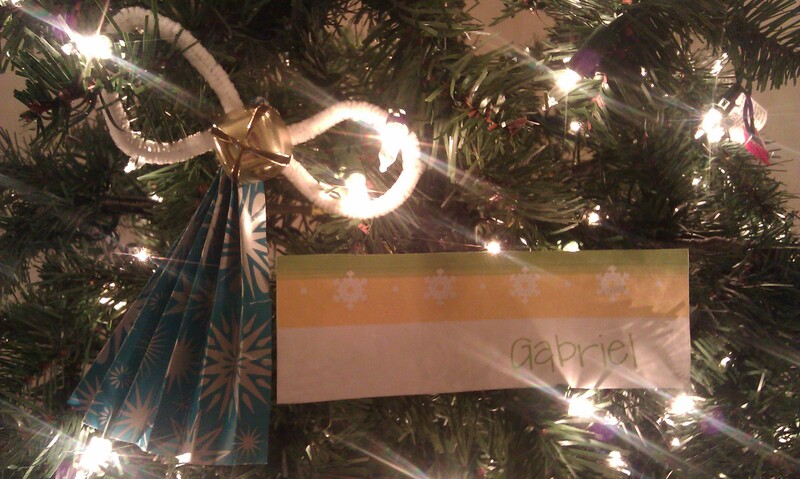 For today’s Truth In The Tinsel craft we made a Gabriel ornament. I thought it was a really cute idea but it was not really a craft Jake could make. I think next year I will have Jacob decorate the wrapping paper with glitter glue before I make it into a fan. 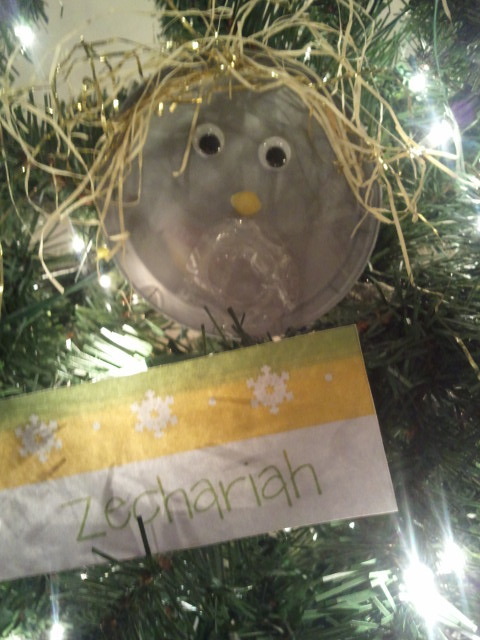 Today’s ornament from the Truth In The Tinsel: An Advent Experience For Little Hands ebook was Zechariah. I like how Amanda had us use a bubble from a piece of bubble wrap as the mouth and then pop it to represent that Zechariah was unable to speak because he didn’t believe God. 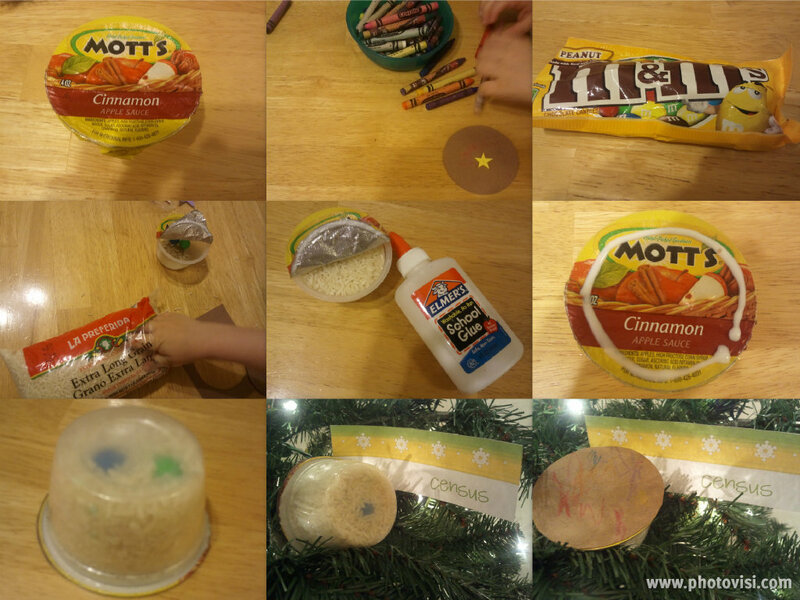 Today’s craft idea came from Truth In The Tinsel: An Advent Experience For Little Hands. 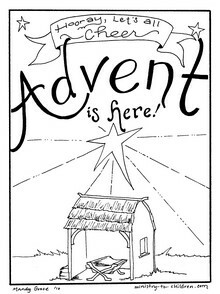 Women of Faith is offering a free download of A Family Advent book now through December 31st. This e-book is 106 pages long and I took a glance inside it and am excited to read through it. They are also offering other freebies, sales, contests, and more in their Countdown To Christmas. Each day is a new surprise! You can find their Countdown to Christmas (which starts today) here.